In 1972, when the Vietnamese war was heading towards the climax, soldiers who had been missing for 6 months sent out a signal crying for help. The only survivor to return to the camp argued that the rest all died. The place where they had the last trace is called R-Point, where the French invaders were killed long ago. 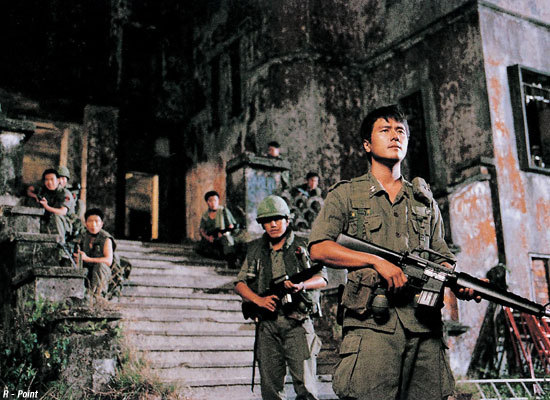 Lieutenant CHOI (KARM Woo-sung) and 8 soldiers searched the place, but were dominated by unknown fear, as Private JUNG is found hung in the noose, dripping blood. R - Point is KONG Su-chang’s directorial debut, who previously wrote scripts for Tell Me Something (1999) and White Badge (1992). KONG confesses that he wanted R - Point to be an anti-war movie. Of course it is a horror movie, where appear the ghosts of French soldiers and a Vietnamese girl in white ao dai, from the colonial era. However, KONG pays attention to the fear of the very land itself where numberless people died with grudge. Are the soldiers really sinners, when they had to kill someone in order to survive? What did the ghosts really want when they put a curse on them? These 9 soldiers are just innocent young men, who did not dare to take the life of a young Vietnamese girl whose gun was aiming at them. Therefore the overall sentiment of R - point is more of sadness than fear. The climax is when the 18-year-old soldier sobs and worries what if his mother does not recognize him. “I want to go home, I want to go home.” The utterances of the soldiers are now heard in his cry, which is now in the voice of a little kid. R - Point was released in 2004, the year when Korean soldiers were sent to Iraq. That is probably why the sorrow of the young souls victimized in someone else’s war resonated even more deeply.